The Five-hundred-meter Aperture Spherical Telescope at Pingtang county in Southwest China's Guizhou province can accommodate a maximum of 2,000 visitors a day. Visitors are not allowed to bring electronic equipment, including smart phones within 5 kilometers of the telescope, as "noise" from such equipment interrupts readings. Completed in September last year, FAST is designed to observe space and look for extraterrestrial life. 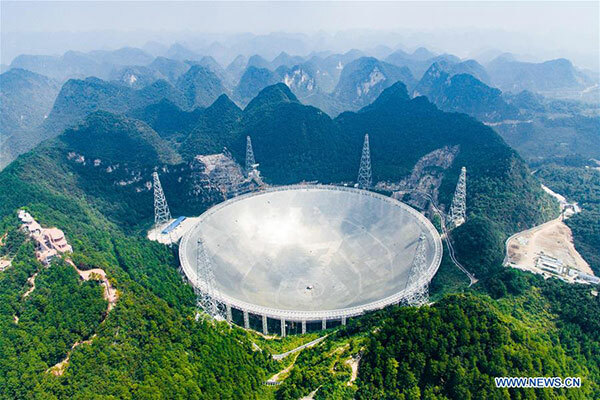 It has a reflector as large as 30 soccer pitches, making it the world's largest radio telescope.